In a recent Notification Railway Protection Force has announced the Computer Based Test Exam Schedule for Constable From March 2019Exam will begin in Group-Wise simultaneously for Constable posts respectively. From 19/March/2019 Candidates will be able to download their Anciallary Admit Card. The whole information regarding RPF Constable/SI Examination Test Centre, Exam Date, Timing & other important details will be updated soon. Candidates need to check the Examination Portal frequently for getting information regarding Admit Card of the RPF Constable Examination. RPF Constable Exam Centers will be allocated soon; it will be in range of 200 km from their respective hometown/residential place. 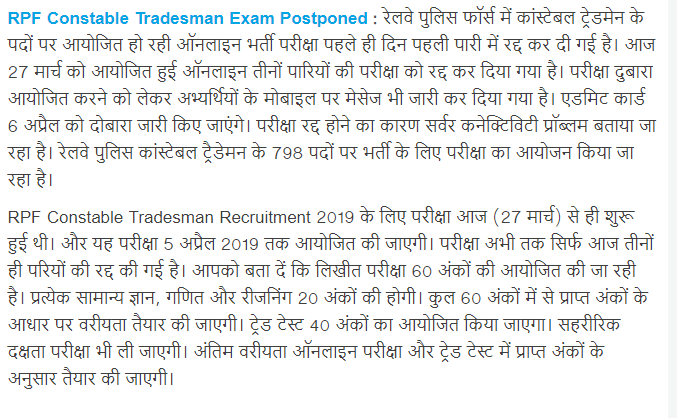 By providing their valid credentials candidates will be able to download their RPF Constable/SI Admit Card.Canbdidates are suggested to be on time to their respective Test Centre. SarkariExam.com wishes all the very best to all candidates. 1. In order to download their RPF Constable Anciallary Admit Card candidates need to go to the important link section provided below. 2. After getting the link candidates need to click it for downloading their RPF Constable Anciallary Admit Card. 4. After providing their details appropriately candidates will be able to download their RPF Constable Anciallary Admit Card. 5. Candidates can also download their RPF Constable Anciallary Admit Card from official site of the RPF Constable Anciallary Admit Card.